You may not know the name, but you almost certainly know the face. 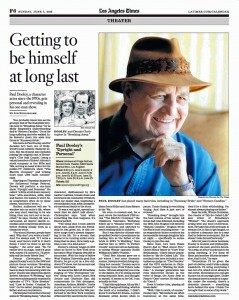 Paul Dooley, who has played dozens of “dads” from Breaking Away to Sixteen Candles — and in several of my favorite Robert Altman films, including Wimpy in Popeye — is about to launch a one-man show (amusingly titled “Upright and Personal”) looking back at his 64-year career as a character actor on stage, in films and on TV. It was a delight to spend time with Dooley for this Los Angeles Times profile; and to talk with his wife Winnie Holzman (creator of one of my favorite series, My So-Called Life) and fellow actor Dennis Christopher. This entry was posted in Interviews and tagged Breaking Away, Dennis Christopher, Los Angeles Times, Paul Dooley, Popeye, Robert Altman, Sixteen Candles, Wimpy, Winnie Holzman on June 5, 2016 by Jon Burlingame.